We'll help you tell a story that reels audiences in. As the demand for multimedia experiences grows, clients are increasingly requesting our video services to amplify their brand message. Whether you need a video to generate buzz leading up to your show, display on-site at your event, or post online afterwards to re-live the experience, this medium effectively captures the attention of many audiences at once. Our video services cover the entire production process end-to-end, from concept to final delivery. From creating on-screen animations for general sessions to designing virtual reality experiences that transport attendees to different worlds, our video capabilities have no limits. With 3D projection mapping, virtually any structure or surface becomes a canvas. Our teams produce video content from the informative to the immersive, from the functional to the emotive. 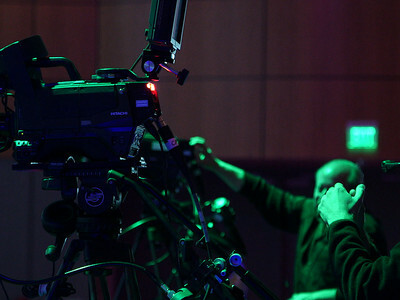 Video can take your event further than it has ever gone before, moving it beyond a one-time experience and helping you provide total connectivity beyond the show floor. Whether attendees are unable to make the event or just need a refresher on the information presented during the conference, we'll capture important speakers and their presentations in either full-motion video or computer graphics. Our custom built system allows for fast deployment, simplified set-up, and high-resolution video and audio recordings. Resolution and frame rates can be defined based on your requirements. We offer an easy-to-use eCommerce portal for the selling and distribution of captured content from your event. Our platform allows users to purchase a video and stream it instantly on any device. Users can log in and watch videos 24/7.